Because in my experience path can be number. First of all, thanks so much for this wonderful progress bar. I was using webpackbar and tried to write a stats.json file to be used by webpack-bundle-analyzer. Due to these two lines (in the start), stats.json is becoming invalid. As Webpackbar, some other Webpack plugins also show compilation time. Obviously this information is not needed twice, so it could be nice to be able hide hide it. Hey. This is more of a question than a bug I suppose. So I've got a client and a server configs for webpack, and both are run simultaneously with npm-run-all. 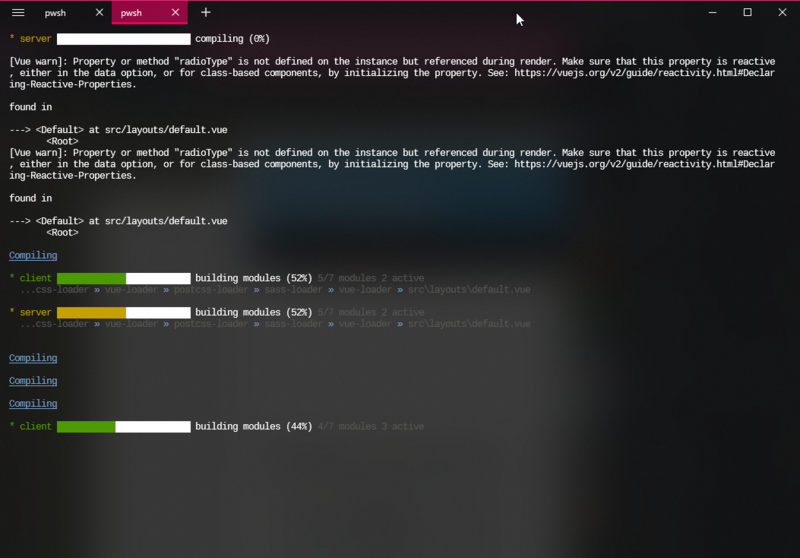 Both configs have their own webpackbar plugins, but since both webpack builds are run independently at the same time, both progress bars are fighting for the same position which results in a flickering effect between them. What would be the correct way to set this up to show two sidebars one above another? (node:19004) [DEP0018] DeprecationWarning: Unhandled promise rejections are deprecated. 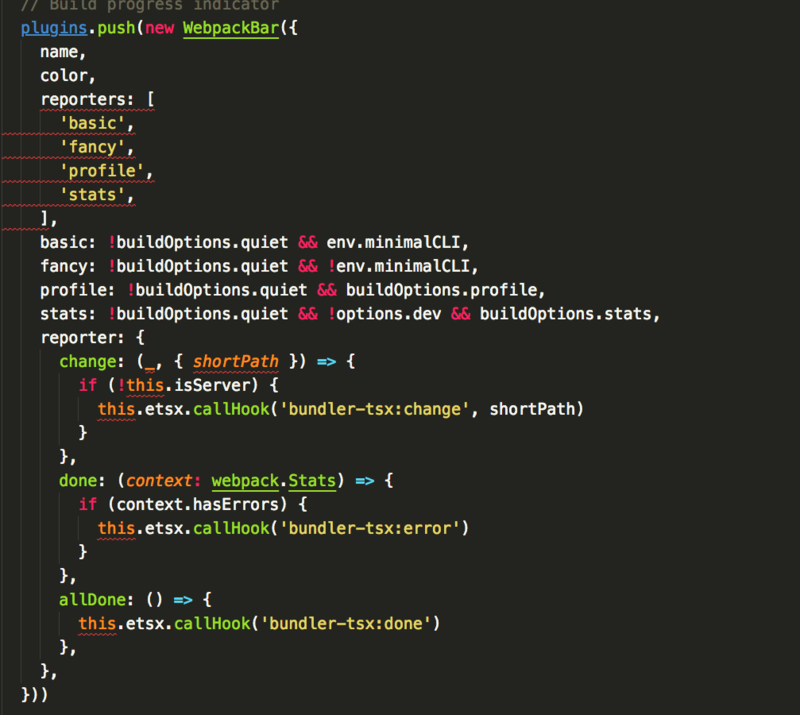 In the future, promise rejections that are not handled will terminate the Node.js process with a non-zero exit code. Or way to reproduce the issue : run tests for ant-design project (https://github.com/ant-design/ant-design) with npm run dist. See CI failure here : https://circleci.com/gh/ant-design/ant-design/24699?utm_campaign=vcs-integration-link&utm_medium=referral&utm_source=github-build-link. update to 3.0.0, There's no Stats by Ext or Stats by Loader. As far as I'm aware, I'm not sure if your new custom reporters will solve this problem. All I want is for the checkmarks to line up and not to have that new line above. I'm combining your module with https://github.com/SamVerschueren/listr in tandem, hence the concern. This has literally zero effect on the actual use of this repo. I just want to align the outputs 😭. However, a lot of the webpack build time is also spent in minification and plugins, would it be possible to add that info? When using the command next it compiles, clears the console on most cases and then it shows you the ip and port where your app is being served on. Just by running the command nuxt. Congratulation for this very nice and useful plugin. 1) show the dev server host only when the first build is completed. e.g. "The application is running at http://localhost:8080"
I don't want to show on subsequent builds. 2) Is it possible to only see the colored progress bar without the information about the build ?